Tai Po Road (Sha Tin Section) is an important primary distributor road linking the Northeast New Territories with West Kowloon (through Tsing Sha Highway) and Tsuen Wan (through Shing Mun Tunnel). To meet the traffic demand, we need to widen a section of Tai Po Road (Sha Tin Section) of about 1.1 kilometres between Sha Tin Plaza near Sha Tin Rural Committee Road and Man Wo House of Wo Che Estate near Fo Tan Road from dual two-lane to dual three-lane carriageway. 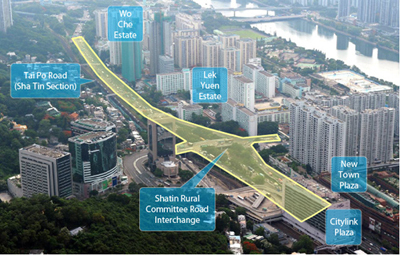 Furthermore, the existing dwellings in the vicinity of the section of Tai Po Road (Sha Tin Section) between Scenery Court and Citylink Plaza and that between Wo Che Estate and Fo Tan Road are affected by excessive traffic noise and it is necessary to retrofit noise barriers on these road sections as well. AECOM Asia Company Limited (AECOM) has been appointed to undertake the design and construction in December 2015. The design work was completed in December 2017. The construction Contract No. NE/2017/05 - Road Widening and Retrofitting Noise Barriers on Tai Po Road (Sha Tin Section) was awarded to China Railway – China Railway First Group – Zhen Hua Engineering Joint Venture and commenced on 27 July 2018. The Services Contract No. NDO 03/2018 - Environmental Team for Road Widening and Retrofitting Noise Barriers on Tai Po Road (Sha Tin Section) was awarded to Fugro Technical Services Limited and commenced on 13 July 2018. The Agreement No. NDO 04/2018 - Independent Environmental Checker for Road Widening and Retrofitting Noise Barriers on Tai Po Road (Sha Tin Section) was awarded to Acuity Sustainability Consulting Limited – Nature & Technologies (HK) Limited Joint Venture and commenced on 16 July 2018.